Whether it’s through technology or appealing to your pet, pizza promotions are finding various ways to attack your taste buds. 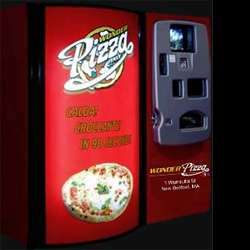 You can now order your pizza pie from a vending machine, via text message or through a social networking site (like Twitter). Environmentally-friendly pizza promotions vie for your attention and hard-earned dollars while beauty can be considered in the eye of the beholder for some doughy creations that aim to bring a whole new look to pizza and the way it is promoted.